Learn about light hanging systems. PARsource offers a variety of light hanging systems to suit your needs. 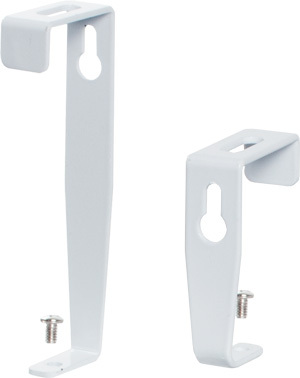 Choose from our Reflector Hanging Hooks, Rope Ratchets or C-Brackets. Used to hang the PARsource Commercial Electronic Ballast in a standard growing environment. This bracket is standard. V-shaped hanging hooks used to suspend GLS and GLX reflectors. C-brackets are hung onto framing member. Bolts or screws can be installed from the top of the c-brackets into the framing member for best results. C-brackets are hung onto framing member. Bolts or screws (not included) can be installed from the top of the c-brackets into the framing member for best results. A unique, compact system that lets you quickly secure a variety of items, including reflectors, fans, and other accessories. Adjusts as needed and automatically locks in place. Hook ends pull tight to secure load - up to 150 lbs. Includes auto feed rope dial, 1/4” metal hooks and 8’ solid braided polypropylene rope (1/4"diameter). Metal components for increased durability and strength. The patented pulley system pulls tight, locks in place, and adjusts easily. Each ratchet holds 75 lbs so the pair can handle jobs up to 150 lbs. Features easy push button and glide action to adjust your reflectors or lights for optimum performance.The all-metal construction features a 6.5 foot cable that holds up to 44 lbs per Easy Glider. Perfect for hanging reflectors. Contains everything you need in one package. No cutting chain off a roll or searching for parts. Resistant to corrosion, this chain will support your ballasts, reflectors, and other heavy materials for years.